"The image quality is superb." Innovative is the word for David H. Stemerman, M.D., and his practice, Open High-Field MRI and CT of Westchester (Larchmont, NY). Bringing state-of-the-art medical care to a bustling suburban New York community, the forward-thinking radiologist was among the first in the country to offer the benefits of open high-field MR, which combines superior image quality with patient-friendly comfort. Stemerman's outpatient imaging center was the first in Westchester County to deliver the diagnostic precision of multi-slice CT and is the only practice in the area to offer CT angiography on an outpatient basis. All of this innovation may come as a surprise because Stemerman does not own a large medical group; he is an independent practice. 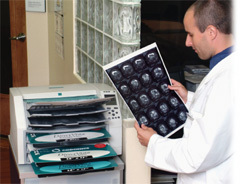 In fact, in 2001, the technology-savvy physician was also one of the first in the country to take advantage of the advanced performance of the Codonics Horizon Multi-media Dry Imager, and the solo radiologist relies on it as his only imager to meet a full range of printing needs, from 14-inch-by-17-inch film to 8 1/2-inch-by-11-inch paper. "When I launched the practice several years ago I couldn't imagine that a good dry imager would turn out to be one of my more important pieces of equipment," said Stemerman, whose center has grown rapidly since opening its doors. "Originally, I thought the practice would be fully digital. However, after talking to referring physicians about soft copy images, I found these would not fit the bill. Almost across the board, referring doctors wanted hard copy." Stemerman quickly learned that even in this digital age, a really good imager is essential. 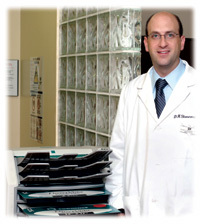 As the first in the local market with state-of-the-art MR and CT, Stemerman saw an opportunity and took advantage of it. However, the practice's costly modalities made meeting the expectations of referring physicians and generating a consistently high level of referrals crucial to his business plan. "After investigating a full range of medical imagers, I knew the Codonics Horizon was the right choice for my practice as soon as I saw it. Our Horizon didn't come bundled with my equipment. When Horizon first came on the market in 2001 I was one of the first direct purchasers in the U.S.," he explained. While impressed with the wide range of features, Stemerman particularly saw Horizon's market-leading versatility as a great match for his practice. As a technology leader in his geographic area, Stemerman received referrals from a wide range of specialists with varying needs and image reporting preferences. Quickly, easily and cost-effectively, Horizon would allow him to deliver images in the physician's choice of format. A single, compact and affordable Horizon Multi-media Dry Imager produces crisp, high quality images in a full range of sizes and media. Horizon relies on advanced direct thermal and dye-diffusion technologies to print both high-resolution grayscale plus vibrant color with 16.7 million hues per dot. The result is laser-quality output at a significantly more affordable cost. "The image quality is superb," said Stemerman. Setting it apart in the marketplace, the Codonics Horizon outputs not only to film but also to durable DirectVista grayscale white film media, which is similar to paper. "This paper-like media is significantly more affordable than film and offers advantages to the end user," he said, pointing out that 8 1/2-inch-by-11-inch paper can be read without a lightbox and placed conveniently in a patient chart without a file jacket. "Often my referring doctors don't have lightboxes and want images they can conveniently show to patients. This 'paper' fits the bill." Naturally, Codonics DirectVista grayscale paper/white film media is significantly less expensive than traditional film. Photographic quality 14-inch-by-17-inch grayscale paper/white film sells for about 25 to 30 percent less than similar sized standard film. But when transitioning from film, a growing number of doctors also are switching form factors to the convenient 8 1/2-inch-by-11-inch paper size, which speeds workflow and costs less than half the price of large format film. Both Horizon grayscale paper and traditional dry film are available in a full range of sizes. "Whatever the doctor wants, I can deliver it," he said. "My referral base really likes this." Stemerman stresses that Horizon paper media is in a class by itself, bearing no resemblance to standard office-quality laser printing. According to the radiologist, "A while ago, a group of local physicians tried to give their referral base paper output from regular office laser printers. The medical community wouldn't accept the low quality. Because of this, initially, I sent out film and then began switching to paper. Now Codonics' sharp, convenient, reflective media is really catching on with my doctors." Making all this choice available at the touch of a button, Horizon accommodates a full range of media simultaneously and seamlessly with multiple media trays. Stemerman also takes advantage of other key Horizon features to meet his practice's needs and streamline workflow. Noting that space is at a premium in a practice with exceptionally large imaging equipment, he also finds Horizon's lightweight design and small (two-foot) footprint a benefit. This also allows for cost-effective and flexible siting. Technologists, in particular, are pleased with Horizon's ease-of-use and reliability. At Stemerman's imaging center, the Horizon prints directly from the modality, but can also print from a PACS. Originally it was connected to the MRI, and the CT was added later. "The connection was instantaneous, and an unlimited number of modalities can be easily added," he said. Stemerman notes that because of the imager's streamlined mechanical design, technical problems have been few and that most can easily be fixed onsite without assistance. "With other dry imagers, I had to call in a technician to fix the problems," he said. Delivering even more reliability and peace-of-mind, the Horizon offers a unique Sunrise Express Warranty program, which is complimentary for the first year. If Codonics 24/7 technical support cannot help the user solve a problem, then the company swaps the imager overnight. The innovative program ensures a working imager will be there the next day at lower cost than typical on-site service plans. Another innovative Horizon feature is the convenient, removable Smart Card, which electronically holds all the imager configuration and feature information--from IP address to film inventory. If the imager ever requires a service swap, the user simply snaps the card into place and continues working. The Horizon's built-in ZIP drive also provides a convenient means of upgrading imager features. As the wheels of technology continue to turn, more and more medical imaging is going digital. However, Stemerman does not see the need for imagers waning. "Demand from referring physicians for hard copy images is going strong. Physicians outside of radiology are not accustomed to viewing images on a computer screen. And even if reports are supplied in digital format, doctors are likely to want hard copy for consults and to give to patients," he said. Stemerman reads and stores his files digitally to optical discs, which speeds workflow. However, he still prints dozens of imaging studies every day. "Our practice is growing rapidly," he said. "I found a niche and got in early with the right mix of equipment and imaging services. Codonics Horizon has been very much a part of that.